Home / Individual Concerns / Who Can Use a Vision Board? Everyone! We often here the question, “Who are vision boards for?” and the answer is anyone who has a goal or dream they want to achieve. One thing to keep in mind is vision boards are universal; everyone and anyone can use them. 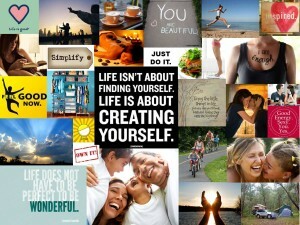 In this post I will share how vision boards can benefit all of us. Recently, many young children are being encouraged to start creating a vision board. Children in elementary school are at the prime stage of discovering their “dreams” and aspirations in life. They talk about wanting to be a firefighter when they grow up, or how they want to be a doctor. To keep these dreams alive, parents and teachers should encourage children to create simple vision boards. Get them to start writing down “firefighter” or “doctor” and find pictures to keep them inspired. Remember, young children are impressionable and can be easily influenced and/or inspired. Teachers should put these boards up as decorations in their classrooms and parents should put them up in their child’s bedroom as a daily reminder of what they’re dreams look like! In doing this, we are able to keep childrens’ dreams alive, even at such a young age. Vision boards are just as influential and beneficial to middle school and high school students. Middle school students can use vision boards to prepare themselves for high school by planning out what sort of extra-curricular activities interest them, what classes they may possibly take, and what clubs/organizations seem ideal. In addition, they may use vision boards to start thinking about college! This leads me to high school students. Unlike middle school students, those in high school need to start thinking more seriously about college. Students can start thinking about possible colleges and universities. Once a decision is made, students can also start planning for their freshmen year. From what to bring to what major(s) interest them, students will realize that these boards will help keep them prepared and organized for what lies ahead. Student athletes can start seriously considering a future in the NFL, NBA, MLB, etc. They can create a board of their favorite athletes, sports teams, and/or college sports. Furthermore, parents and teachers should continuously encourage their children to create effective vision boards to stay on top of their academics and lock in success for their futures. Fast foward to college. College is the age of discovery for most young adults. Some students like myself actually go through an identity crisis where we attempt to rediscover what it is that interests us. For me, one of the biggest struggles was finding a major that would interest me and keep me satisfied throughout my college career. Looking back, I truly wish that I had been more familiar with vision boards t an earlier age. They would have helped me better evaluate all of my interests and top major choices, and make a faster decision. For graduate students, these boards can be an open canvas to seriously explore career possibilities. For freshmen, they can be an opportunity to narrow down some of their favorite major(s). For sophomores and juniors, they can help in exploring extra-curricular and club/organizations that could further boost their resume or academics. There are multiple ways in which vision boards will be of major help to all kinds of students, and so it should be something to always think about when making serious academic decisions. Aside from youth to young adults, practically anyone else can use vision boards! When entering the adult life, there are so many milestone events and/or life decisions that need to be made. We may find love and get married, have our first child, buy our first home, build a career, or become a grandparent. All of these are milestone events that you definitely want to keep in memory and prepare for. When making that final decision to buy your first home, you want to keep in mind what you look for in your “dream home”. Use a vision board to lay out the interior and exterior of the home, imagine what you bedroom would look like, draw out what kind of decor would be included, etc. Thus, you prepare yourself for that big purchase and can keep it marked as a major milestone event. You can create a board to plan for your dream wedding, create a list of what you need to know as a first-time mother, or how to embrace being a grandparent! Last but not least, let’s get rid of the assumption that vision boards are “feminine”. Believe me, men will find these boards equally helpful! Both men and women dream, and we both want to be able to map out our future and lives. Instead of using the stigma and stereotype to hold us back, let’s dream out loud together to achieve our dreams and accomplish more than we could imagine!